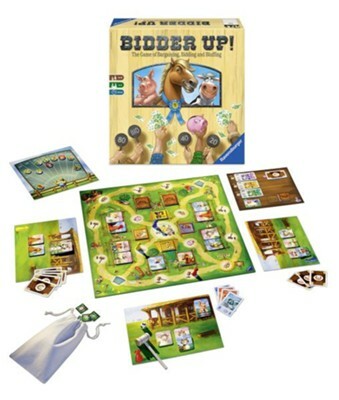 Show off your farming prowess in this game of bargaining, bidding and bluffing! During a series of auction events, you'll stealthily try to trick your opponents to acquire animals for your farm. Use strategy and your best bargaining skills to increase the value of your farm animals on the open market. Collect complete sets of animals, earn the most points --- and win! With 10 unique auction events to choose from, each game is a different adventure! Easy and Advanced modes offer accessible game play experiences for both budding and seasoned farmers! Recommended for ages 10 years and older; for 2 to 4 players. Contents include: 1 two-sided game board ("Easy" and "Advanced"), 50 bills of play money, 4 farmers, 1 spotted die, 4 farms, 30 animals, 10 auctions signs, 1 supply board, 1 market board with 10 animal counters, 1 gavel, 1 bag containing, 24 raffle tickets, 1 top prize, 6 IOUs, Instructions. I'm the author/artist and I want to review Bidder Up! Game.